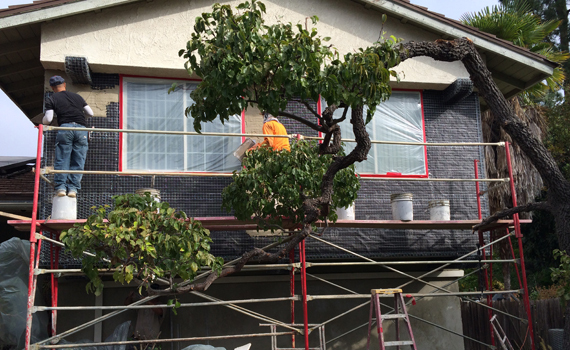 See a professinal stucco project come to life! Modern stucco is used as an exterior cement plaster wall covering. It is usually a mix of sand, cement, lime and water, but may also consist of a proprietary mix of additives including fibers and synthetic acrylics that add strength and flexibility. Modern synthetic stucco can be applied as one base layer and a finish layer, which is thinner and faster to apply, compared to the traditional application of three-coat stucco. 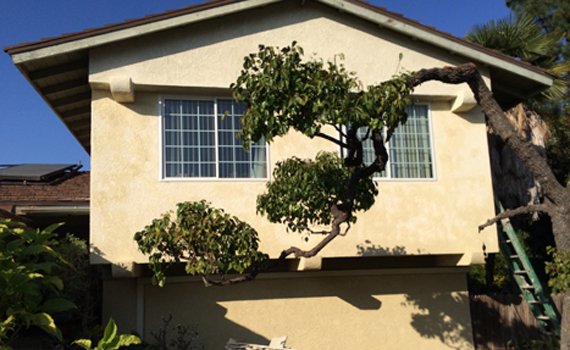 As with any cement-based material, stucco must be reinforced to resist movement cracking. Plastic or wire mesh lath, attached with nails or screws to the structural framing, is embedded into the base coat to provide stiffening for the stucco. One method often used to help conceal the smaller surface cracks that may appear is the application of one of a variety of pre-mixed acrylic finishes, which have the ability to stretch and bridge over cracks, improving appearance and limiting the passage of moisture behind the stucco. Where stucco is to be applied to a structure of wood-framing or light-gauge steel framing, the framing is protected from moisture damage by applying a vapor-permeable, water-resistant weather barrier; typically an asphalt-saturated paper or one of a variety of manufactured plastic-based sheets, known as "building wraps" or "stucco wraps". The properties of the weather barrier must not only protect the framing from rain and moisture, but at the same time allow the free passage of any water vapor generated inside the building to escape through the wall.